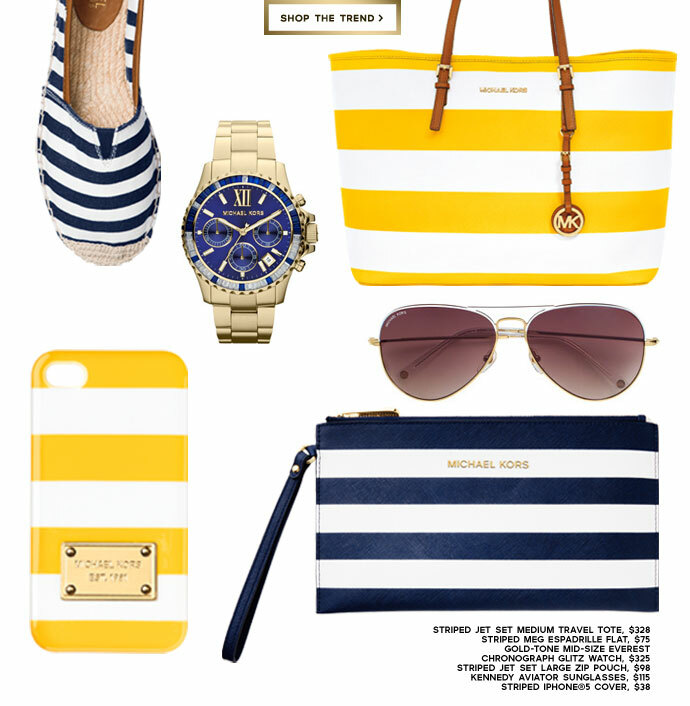 If there is one trend that I have been subconsciously obsessed with from young, it’s the nautical trend. Navy was once my favorite color (*gasp* above purple!). I remember going on a shopping trip with my parents and when I came home, cleaned out my closet and put all my new clothes up, it was a sea of navy. Add white stripes and chances are I will not be leaving the store without it. So this time of the year when everyone is pushing the Nautical trend I am in my element and also in a constant battle to not buy everything I see that I like. I’m trying to go for more classic pieces that can be worn outside of the season and not just for now. On Sunday as I was going through a magazine, either InStyle or Redbook (they’re in the recycling bin now) and I came across Alyson Hannigan in a striped blazer, white shirt and pants and brown wedges and I cut it out. THAT is my look! Immediately I started a search for a striped navy and white jacket. The thing is, I didn’t want a bold stripe. 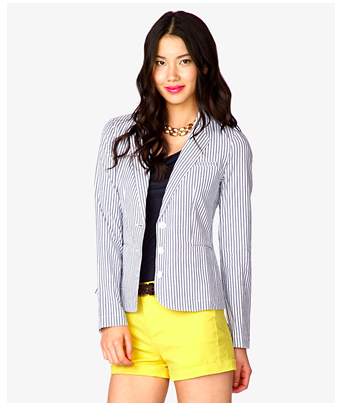 So when I came across this blazer on Forever21 I knew it was the one. I want to change the buttons to big navy buttons though, to make the navy pop a little more. I know I’m not supposed to be shopping but you don’t not buy something on Forever21 because chances are it won’t be there the next day or in 5 minutes. Report’s website is currently down for upgrades so I found them on DSW’s website. They’re also cheaper on this website (by $3 lol)! But at least I was able to go in and try them on because the crochet is half size bigger which meant I had to order a half size down from the striped pair. 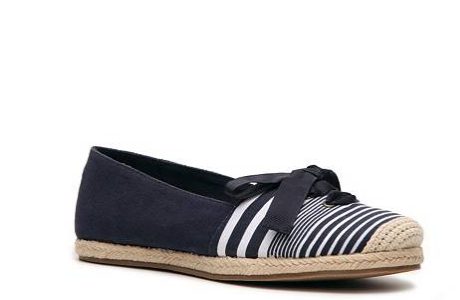 I’m always looking for cute flats because I can’t always wear slippers or sandals here in Seattle, and if I travel to somewhere sunny in the Summer, it’s only for two weeks or less. So having a nice collection of enclosed comfortable shoes is a must. Yes I said collection. Choice is critical. The good thing about these shoes is I can see them with white shorts, and most of all a white cotton dress – my Summer fave! 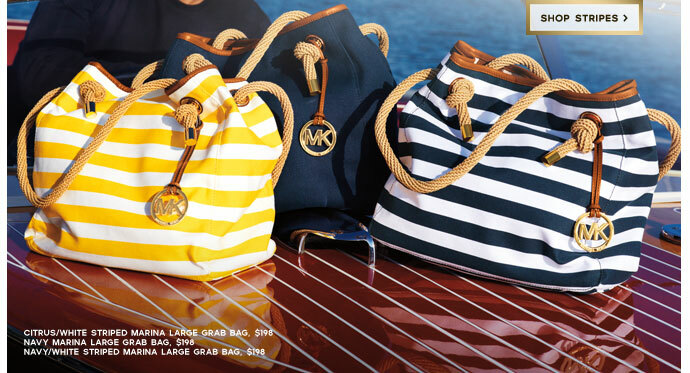 I am DYING to get my hands on one of the Marina Grab bags! I would go a size smaller if they have any but I’m just in love with these bags and the rich colours he uses! I love the brown trim and that navy is just devine! *sigh* Any trends that you can’t seem to shake? Don’t even mention not wearing white after Labor Day! I’m from the Caribbean, white deserves to be worn every day! If they had a white and red one I’d get one!